Moravek’s AP model flow pasteurizer has been designed for the in-line pasteurization of still beverages with a fruit content of up to 100% and sugar syrup not exceeding 70 Brix. The temperature of pasteurization is adjustable within the range of 70 to 100 °C. The AP model has been developed to enable flow pasteurization of beverages directly into a filler or any other suitable equipment. 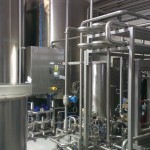 The pasteurizer consists of an efficient plate heat exchanger which is constructed with three independent sections, a main and a booster pump, heating circuit, cooling circuit and a compact valve cluster with two product tanks. The model is fitted to a base frame which includes the flow distributing plate and electric control panel. The AP model delivers high quality pasteurization while maintaining an exact temperature as well as flow and time delay control even during an irregular filler run. The fully automatic changeover from water to beverage is designed to ensure minimum loss during any procedure. Energy recovery of up to 92% is made possible through the use of an extremely efficient plate heat exchanger. An indirect hot water circuit can be used to heat the product using steam or electricity if required on request. Hot sterilisation is automatically carried out prior to use. In the event of an emergency or electricity failure the product is stored and hot sterilisation takes place. Products are automatically prevented from accumulating in the tank after a longer break. Heat exchange plates include positive pressure difference control. Delivery pressure is fully adjustable. An automatic CIP procedure is included with the model without the need for a separate CIP unit. The Allen-Bradley control system incorporates a 6” TFT display for easy operation. Pasteurization records can be printed. 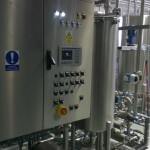 The ability to communicate with syrup room, mixer and filler is fitted as standard. Operator intervention is unnecessary with the exception of the changeover of flowplate and during the initial choice of procedure on the control panel. The AP model is simple to operate and maintain with easily changed fully automatic procedures and minimal moving parts. A different length temperature time delay snake can be fitted on request.